Can a Vampire Inspire Other Soaps to Rise from the Dead? On the weekend of May 23-24, as part of its “Countdown to Decades Binge,” a new television channel, Decades, ran 130 episodes (about six month’s worth) of the 1966–1971 gothic soap opera, Dark Shadows. As someone who studied the show, but had never actually seen it in any kind of systematic fashion, I felt like an archaeologist transported back in time to witness people and events I previously knew exclusively from artifacts and the reports of others. And there Dark Shadows was in all it’s glory. The blurry camera-work, the shaky sets, the actors stumbling over their lines because they were allowed just one take, and the famous boom mics dipping in and out of shots. It was fantastic. Not in a campy way, but in a truly engrossing one. Somehow – even with fake tombstones, costumes from a mishmash of historical time periods and rubber bats on strings – the show managed to convey both a genuine sense of eerie menace along with sympathy for the characters, be they vampire, werewolf, witch, unethical doctor, or simpering heroine. 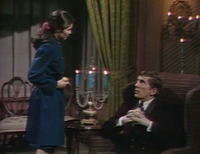 Dark Shadows had everything a soap and a horror story should. And they did it all on a budget that would make Tim Burton (director of the 2012 remake) and Joss Whedon (who many mistakenly believe invented the tortured-demon trope on Buffy the Vampire Slayer) weep. When I interviewed actress Kathryn Leigh Scott (Maggie) for my book Soap Opera 451: A Time Capsule of Daytime Drama’s Greatest Moments, she had quite a lot to say about working conditions on Dark Shadows ... and the dedication of its cast and crew: “One lunchtime, I dropped by the studio to pick up some scripts and check my schedule. I found producer Bob Costello and June, the wardrobe supervisor, wrestling with a clothing dummy draped in veils and an antique lace dress. The idea was that this dummy, properly lit and photographed, would appear as a ghostly apparition named Josette. No matter what they did, it looked like a dummy draped in tatty cloth. I offered my two-cents’ worth of advice and was rewarded with Bob’s offer to dress me up in the gown and let me stand-in for the dummy. “She jumped to her death off Widows’ Hill,” I was told. “I was positioned in front of the camera in a greenish light and a fan blew against my face causing my eye to tear up and weep. Poor Josette! I was practically sobbing and couldn’t help myself. I lifted my weary arms, as instructed, opened my mouth and soundlessly entreated my lover to ‘come to me, come to me ....’ I was there for hours having a wonderful time. “In a later episode, when Josette’s ravaged, ghostly presence (above) appeared, makeup man Vinnie Loscalzo designed gruesome makeup – a ping-pong ball painted like an eye and glued to my cheekbone with my own eye covered in putty and grease paint. The worse he made me look, the worse I wanted to look. The more battered and bloody, the better, I thought. I wanted my hair dripping like seaweed around my face and more bloody gashes around my bruised and blackened eye. “A couple of actors had thought I was crazy to volunteer for ‘extra’ work and wondered if I was getting paid for it. So I asked Bob if I was getting paid. No, he said, it wasn’t a regular show for me. I wasn’t going to be paid at all? He didn’t think so. After all, they could still use the dummy! But they were deeply beloved. It’s no wonder then, that 44 years after the show went off the air on ABC, in addition to the Tim Burton big-screen release, there are numerous Dark Shadows novels (several written by Scott herself), nonfiction works and original audio dramas featuring the veteran actors. With so many mourned soaps canceled in just the last few years, would you be interested in continuing your stories via books like As the World Turns: Oakdale Confidential or Guiding Light: Jonathan’s Story, audio plays narrating life in All My Children's Pine Valley and One Life to Live’s Llanview, or even a combination of the two, such as P&G’s now defunct Another World Today? If there’s enough interest, perhaps other canceled soaps will follow in the footsteps of Dark Shadows and rise from the dead! Source: Alina Adams, EW Community, May 19, 2015. I'm not sure what the author means by other soap operas following in the steps of Dark Shadows. Those shows lasted for years and years and although they were extremely popular, they didn't have a cult following like Dark Shadows. When I was a kid, I used to love staying home from school and watching As the World Turns and the other soaps. My mother and grandmother and their friends used to watch them every day and sometimes they'd talk about what was happening on the soaps and if you didn't know they were talking about a TV show, you'd think they were talking about people that they knew.